Bhogali Bihu also called Magh bihu in Assam. Bihu is the national and the Biggest festival in Assam. 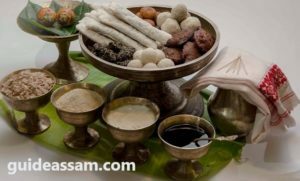 Three types of Bihu celebrate in Assam. The Bihu festival signifies a celebration of farming. Magh Bihu ( Bhogali Bihu ) is celebrated in of January. Magh Comes is a Month of Assamese calendar. Magh Bihu celebrated first day of Magh Month. The celebrations of Bhogali bihu starts one day before the actual day. 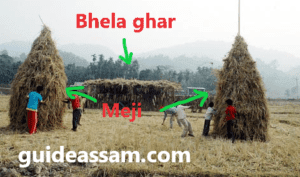 In Bhogali bihu people build "Meji" a structure is made by wood and tree leaves. People build temporary houses called 'Bhela Ghar' to to stay for the night. these houses are usually made up of hay. If you want know What is Bhela Ghar and how to made it?. People staying in the bhela ghar that night and celebrating Bhogali Bihu. Even if you are not staying in Bhela ghar, few families cook together and share the dinner. special moment food which is called "Bhoj". What is the special actual day of Magh Bihu ( Bhogali Bihu )? Actual day of the Magh Bihu ( Bhogali Bihu ) everyone takes bath at the dawn itself and proceed to the "Meji". The Meji is lit up by one old member of the village. All the villagers get together in the Meji and consummate many rituals. Many types edibles like coconut, betel nut, etc. youths withal relish with cracker like thing composed of bamboo called 'hiloi'. magh bihu is celebrated at a season when winter is about to go. it is believed that the fire of Meji burns the winter out. Various types of snacks are made and every Assamese family try to make some traditional snack on Bihu. Though we may not stay in Assam during Bihu, but all Assamese people celebrate it same enthusiasm all over the world. Even in Kuwait we celebrated it with lot of passion and fervor though the weather was gloomy and drizzling. You can also check Bhogali Bihu Special Dish along with Recipes. If you have any suggestion Below I am Waiting for your comment. If you want to Publish your Article at Guide Assam you Visit Publish link and write your article now. You can also check our Bahgajor logot Patha Mangxo. Or How to made Baahor Chungar Maach.